The son of noted Quebec sculptor Louis-Philippe Hébert, Adrien Hébert was born in Paris while his father was there working on bronze castings. While studying in Paris, Adrien would often cut classes to observe the boat traffic plying the Seine River. He returned to Montreal in 1914, and this keen interest resurfaced in 1924 when he began to paint that city's port, depicting ships, trains and city streets with great vitality. 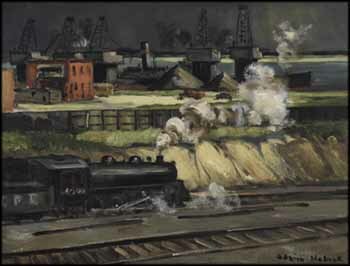 These works were often multi-layered compositions, such as this vigorous industrial scene dominated by the charge of the steaming locomotive. Dominion Coal, Montreal exemplifies the social realism prevalent in the 1930s, when workers and their modern machines were seen as important subjects. Hébert has captured a fine sense of atmosphere here, drawing the eye to the pale ground and banks above the tracks and the white steam pouring from the locomotive in the foreground, contrasted against the smoky, dusky background. Prominent Montreal dealer Watson Art Galleries showed his work, and he achieved considerable recognition during his life - a painting in a 1938 show at London's Tate Gallery was acquired by the National Gallery of Canada. There will be an exhibition of Beaver Hall artists, including the work of Hébert, at the Montreal Museum of Fine Arts from October 24, 2015 to January 31, 2016, entitled Une modernité des années 1920 Montréal, le Groupe de Beaver Hall / 1920s Modernism in Montreal: The Beaver Hall Group.